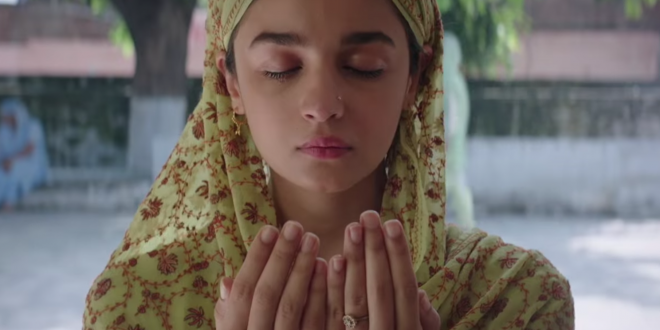 Diminutive, dazzling Alia Bhatt conquers stardom with her dynamic performance as “Shemat” a Muslim girl willing (raazi) to sacrifice her life for the love of India; marrying a Pakistani man “Iqual” (Vicky Kaushal), she fills her dying father’s (Rajit Kapoor) wish, to take his place as a spy for India; the story revolves around the Indo-Pakistani 1971 war. “Raazi” is a no nonsense narrative about loyalties and to what lengths one would go to protect them; denying love, committing murder, transforming oneself into a lethal weapon. Shemat’s transformation, infused with dignity, evolves to the point where her sanity is threatened by her obligations; Bhatt’s galvanizing depiction confirms her status as one of Bollywood’s elites. Serendipitously her mother Soni Razdan, plays her fictional mother in the film. Director Meghna Gulzar uses a quasi-nonfictional heroine, (we first see her as a college coed, running through traffic, to protect a scampering squirrel) whose innocence is shed for a higher purpose; her concrete acceptance and embracement of her mission resonates from her core. When life’s fissures intervene, her irrepressible challenges appear insurmountable. “Raazi” dissolves East/West boundaries, appealing sensationally to the Western audience: compelling chronicle, solid, stunning performances; rips to the skeleton what war and subterfuge can do to alter one’s spirit eternally.